TV chef Jamie Oliver’s tireless campaigning to get us all eating better could be reaping rewards in the most unlikely of places. Because as well as helping our waistlines, the culinary activist could be helping stave off hair loss, too. One of the most surprising things about hair loss is that it can be influenced in some cases by a whole number of unexpected things – including the food we eat. A good diet probably won’t stop you losing hair if your genes/physiology are already heading down that route, but eating well and staying healthy may delay things somewhat, or at least not worsen any existing hair thinning. Since 2008 – not long after he started campaigning to try and make school dinners a touch more healthy – Jamie has been running Ministry of Food classes at four locations around the country, the goal being to get people cooking more confidently and with an eye on healthy, fresh ingredients. Now, a new study by the University of Leeds has found that Jamie’s courses have long-lasting positive effects. According to researchers, who surveyed 800 Ministry of Food attendees who went to Jamie’s workshops between 2010 and 2014, the amount of fruit and veg they now eat compared to what they used to eat has skyrocketed. Immediately after the courses attendees’ fruit and veg portions increased from 2.7 per day to 3.4 – with the number rising even further once they’d settled into a habit of using fresh food. Six months later and clearly influenced by their Jamie Oliver experience, the average daily number of fruit and veg portions had risen to 4.1 – a hike of more than 50 per cent compared to what they ate before attending the course. 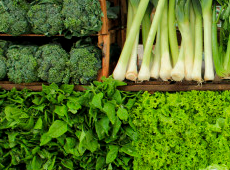 One of the most common diet-related factors to influence hair health is an iron deficiency. This can reduce the amount of haemoglobin in the blood, meaning that hair follicles in people with anaemia can become starved of oxygen and thus suffer. Zinc deficiency is also quite commonly seen: this can cause hair shafts to weaken so that they become brittle. A bad diet can also play a part in Type 2 diabetes, which in turn can lead to thinning hair, either because of hormonal imbalances or as a result of other medical complications. Whilst the extra shedding caused by these types of dietary imbalances and related health conditions is often temporary, it can trigger or accelerate Male Pattern Baldness or, for women, Female Pattern Hair Loss in those people who have an inherited predisposition to these permanent, genetic conditions. 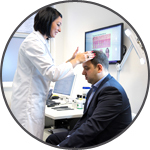 For this reason, the whole lifestyle of Belgravia clients is considered when staff devise a bespoke hair loss treatment course, as diet – alongside stress, smoking and even fitness regimes – can play an important part in overall hair health. For those who are not getting enough of the right nutrients needed for healthy hair, a daily food supplement called Hair Vitalics can be included in treatment courses – although it is also available to non-clients – to ensure these bases are covered. While Jamie Oliver is unlikely to have had hairloss on his mind when first devising his Ministry of Food courses, he will no doubt be delighted that he is helping people in any number of ways.